Is the FBI a political organization run rampant, using trumped up charges against anyone with whom they or the political elites disagree? That’s what you would be told from the likes of Hillary Clinton, Donald Trump, and now Bernie Sanders. All three (or Bernie’s wife rather) have been embroiled in some sort of FBI shenanigans within the last year. For Hillary, even though she was obviously a corrupt crook, she was not charged, despite Comey basically admitting she should be charged. But still, the FBI released a damaging letter just weeks before the election. Officially, this hurt an “innocent person”, but in real life, it was a meager attempt to assign blame to someone everyone knew could outmaneuver any authorities. So in that case alone, no matter how you slice it, the FBI was alternatively corrupt, incompetent, complicit, and political. Interestingly Clinton supporters had no problem wholeheartedly condemning the investigation into Clinton assuming it to be a political charade to damage an innocent woman. But then those same people had no problem flipping and assuming an FBI investigation to equal guilt as soon as Donald Trump was dragged into one. But what is more, is that Trump was actually never personally under investigation by the FBI. So not only does the FBI have the power to ruin reputations over investigations, the agency doesn’t even have to have a case to bring its weight to bear. Comey’s silence is what really made the media blow up over the whole Russian ties meme. No wonder Trump fired a guy who refused to publicly state the truth about the investigation, knowing his silence was fueling false rumors. Bernie Sanders’ wife may have committed fraud while filling out applications for student aid for the now bankrupt Burlington College of which she was President. Go figure a Socialist ran a college into the ground. Maybe that’s why she had to lie on the applications; the true problem was she wasn’t being given enough of other people’s money! But no, I am only joking, because an investigation does not itself prove guilt. In America, you are supposed to be innocent until proven guilty, despite how strong the evidence is against you. And that is the problem, that the FBI has massive power to throw their weight around, smear and drag down politicians all outside of their official capacity as an investigation agency. Whoever directs the FBI will have to much power, because a simple letter or remaining silent can throw the media into a frenzy of finger-pointing, accusations, and false conclusions. They can turn nothing into a scandal and a scandal into nothing. And while people sway back and forth, deciding based on the circumstances whether the FBI is legit or not, all I see is a big steaming bowl of corruption. It seems that an FBI investigation is just a political tool available for purchase. It seems also that the dropping of an FBI investigation is a political product available for purchase. Power is the currency in Washington, and politicians have countless ways to pay their debts or collect what is owed to them. This behavior should not be surprising from such an organization as the FBI. Every level of government behaves the same way. They take your rights and sell them back to you for the price of a license. The IRS points a gun at your head and says the price to put it down is about 50% of what you earned last year. The local police do the same, as well as the state tax collectors and enforcers, and so on. But there appears to be little coordination or organization in who the FBI strikes. Clearly, the Clinton investigation would have benefited Trump the most. And then, it was a Trump staffer from Vermont who made the original allegations against Sanders, which appear to be at least somewhat true. But Trump was also targeted by the FBI for some bad press at least.But despite all the investigations, nothing really comes of it. Despite all the investigations, nothing really comes of it. So is the FBI really just the newest tabloid, the National Enquirer for politics, quietly dropping any initially well-publicized story that either turned out to be false or an inconvenient truth? What conclusion can we come to other than that the FBI cannot be trusted to do its job, do its job right, and only do its job? And this is only talking about what disorganization the agency has fallen into over the past year or two. There are a million other reasons to believe that the FBI is hopelessly corrupt; just look briefly into the agency’s founding under J. Edgar Hoover or one of their darkest moments surrounding the assassination of Martin Luther King Jr. The only real solution would be disbanding the FBI. It, like most other government agencies, has simply become a tool of politicians and bureaucrats to wield power and climb the DC ladder. With most government agencies, we should be asking, would this organization still exist in a free market? The way the current FBI behaves it would likely see customers and investors flee. The agency cannot be trusted and is currently a larger threat to individuals’ rights and freedoms than it is a protector of those liberties. Where was the devastating revelation about Trump’s crimes during James Comey’s Congressional testimony yesterday? If James Comey’s testimony before Congress yesterday were a Hollywood movie, and if the press weren’t obliged to make a very big deal out of it, the studio that produced it would have shut it down and eaten the box office losses. The movie theaters would have been empty, except for a few stragglers getting out of the rain. We did learn that Comey leaked his “memo” of a conversation with Trump (about the Michael Flynn investigation) to the press. So the FBI director is a leaker. And we only have Comey’s word that his “memo” notes were correct and accurate. Then Comey stated that Attorney General Loretta Lynch told him to call his investigation into Hillary Clinton’s private email server a “matter,” not an investigation. So the former Attorney General was a partisan Hillary supporter. Comey asserted that Trump “pressured” him to cease investigating Michael Flynn. Trump didn’t order Comey to stop that probe. And Trump could have, because the president, in the chain of command, is over and above the Justice Department and the FBI. Oops. That’s right. So…where were Comey’s revelations yesterday? Nowhere. Where were his explosive charges about Trump’s crimes? Nowhere. Comey should really take a long vacation. He should disappear from public life for quite some time. He’s embarrassing himself. Recall the last bad movie Comey starred in. The Hillary email server scandal. The FBI probe was off, it was on, it was off. Early in this fiasco, Comey delivered a televised press conference. FBI directors don’t hold press conferences, but Comey did. He simultaneously played the role of FBI head, grand jury, Attorney General, and Constitutional jurist. He only held one of those jobs, but that didn’t stop him. He laid out, end to end, Hillary Clinton’s violations of federal law governing the handling of classified materials. He failed to note that “hostile intent” is no part of that law. He failed to note that negligence is the only standard for prosecution. He said that since Hillary (who was surely negligent) didn’t intend to cause harm to the nation, he wasn’t recommending prosecution. Now THAT should have been the subject of a Congressional hearing. But it wasn’t. Before that, Comey starred in a little known movie called HSBC. In 2013, before his appointment as FBI director, Comey was brought in by the scandal-ridden HSBC Bank, to oversee efforts to clean up its act—in particular, money laundering for drug cartels. Comey was positioned as the face of honesty and competence for HSBC. How well did he do, before he exited his position? How much crime and how many criminals did he leave behind? I guess Comey didn’t clean up the HSBC mess. There were a few things he didn’t notice while he was there. A few thing he left behind. A few billion things. I guess that uniquely qualified him for appointment as FBI director. So here is my memo. It’s directed to Netflix, Amazon Prime, Hulu, and assorted Hollywood studios: “Before you sign Tom Hanks, Alec Baldwin, Stephen Colbert, Michael Moore, or Caitlyn Jenner to star as James Comey in a heroic biopic, ‘Don’t Cry for Me, America,’ check your brains. It’s a loser. A representative of the FBI was grilled by the House Committee on Oversight and Government Reform regarding the agency’s growing biometric database. Washington D.C. – On Wednesday the House Committee on Oversight and Government Reform questioned Kimberly Del Greco, Deputy Assistant Director at the FBI’s Criminal Justice Information Services Division, about why the bureau broke the law by failing to file a privacy impact statement acknowledging the collection of millions of Americans’ faces for the agency’s new biometric identification system. The FBI’s Next Generation Identification (NGI) system is made up of fingerprints, iris scans, faceprints, and other facial recognition data. The NGI organizes Americans’ biometric data into a single file that includes personal and biographic data like name, home address, ID number, immigration status, age, race, etc. 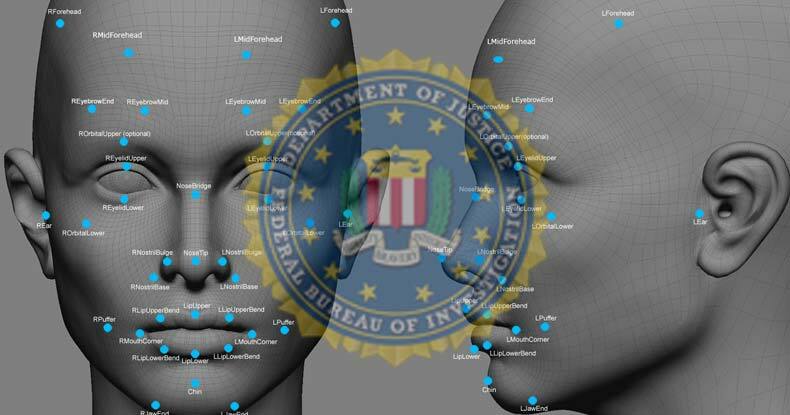 With NGI, the FBI will expand the number of uploaded photographs and provide investigators with ‘automated facial recognition search capability.’ The FBI intends to do this by eliminating restrictions on the number of submitted photographs (including photographs that are not accompanied by tenprint fingerprints) and allowing the submission of non-facial photographs (e.g. scars or tattoos).The FBI also widely disseminates this NGI data. According to the FBI’s latest NGI fact sheet, 24,510 local, state, tribal, federal and international partners submitted queries to NGI in September 2016. Alvaro Bedoya, Executive Director, Center on Privacy and Technology Georgetown Law, questioned the FBI’s claim, stating that the bureau has access to driver’s license photos. “We have access to that data but we do not use it,” Del Greco answered. Jennifer Lynch, Senior Staff attorney with the Electronic Frontier Foundation also stated that the FBI has access to “civil photos” in the NGI database. Duncan is not far off. The databases include photos those of people who aren’t suspected of any criminal activity that come from driver’s license and passport and visa photos. Other issues with the FBI database include misidentifying females and blacks at a higher rate. The FBI is currently facing a lawsuit from EPIC regarding the database. EPIC is asking a judge to force the FBI to release records about its plan to share the biometric data with the U.S. Department of Defense. EPIC filed a Freedom of Information Act request in 2015, but the FBI has so far refused to release the 35 pages of responsive records. In 2014, the EFF received documents from the FBI related to the NGI system. At the time the FBI estimated the facial recognition component of NGI would include as many as 52 million face images by 2015. The Committee’s hearing on Wednesday indicated that number was more than double as of 2017. The danger of abuse from facial recognition programs is on the rise. Activist Post recently highlighted a new report from Georgetown Law University’s Center for Privacy and Technology that details how law enforcement is using facial recognition software without the knowledge or consent of the people. The report, “The Perpetual Line-Up: Unregulated Police Face Recognition in America,” examines several cases of misuse or abuse of facial recognition technology. How can we protect our privacy in a world that is quickly becoming a digitally interconnected panopticon of audio recording devices, faceprint collection machines, and cameras from every direction? The answer is not simple. Most of us live our lives with these devices and use them for several hours each day. When we are staring into our phones to send text messages, the camera is potentially stealing our faceprint and sending it to your cell phone provider and/or law enforcement. We are giving away our privacy for convenience, luxury, and entertainment. How can we stop the fast march to a total surveillance state? Perhaps abandoning all technology and living off the land. Short of that, we need to take measures to encrypt our communication and practice a culture of security. The FBI’s Fourth Reich began as a result of German efficiency and has by now silently taken over all aspects of the FBI. So impressed was the FBI with German authoritarianism, that the FBI recruited at least 1,000 thousand Nazis over the years and especially at the end of the war. While thousands of Nazis were allowed to immigrate and were given disguised identifies, Jews were turned away from the US at the same time. They were supposedly considered a security risk. American taxpayers have been helping to support these ex-Nazis ever since. Those who have attempted to expose the US’s involvement in harboring Nazis have been attacked by the FBI, harassed and more recently declared a threat to national security. It is the FBI more than any other agency that wields these virtually unbridled powers domestically. It tactics include, “surveillance, disinformation, blackmail, entrapment, intimidation, harassment and indoctrination, governmental overreach, abuse, misconduct, trespassing, enabling criminal activity, and damaging private property” … and more. Post-9/11 Congress has virtually abdicated responsibility, partially because by law, the FBI is supposed to collect a dossier on them. The FBI pretty much does as it wants beyond the reach of laws that would limit its abusive power or make it subject once more to constitutional limits. It illegally operates over 50 offices abroad, though its brief is supposedly only domestic. It has set up its own illegal repository of “profiles of tens of thousands of Americans and legal residents who are not accused of any crime.” Increasingly this database is available to private entities for routine background checks. The agency has a budget of over $8 billion and issues tens of thousands of National Security Letters that collects financial records and other personal information on a very questionable basis. Law enforcement agencies also using social media tracking software to monitor Facebook, Twitter and Instagram posts. Moreover, secret FBI rules also allow agents to spy on journalists without significant judicial oversight. You don’t have to be vocal about such views. The FBI will come to you, as it routinely infiltrates groups and businesses of all kinds. If you have “anti-government” sentiments you can easily be caught up in FBI investigations and blackmail and entrapment. In the wake of the 9/11 terrorist attacks the FBI started to create “forward leaning—preventative—prosecutions” that ensnare and utilize informants who are given permission to break the law to bring the case to a successful conclusion. Sometimes these informants first commit crimes that get them caught by the FBI, and some speculate even “mind control” may be experimented with. We have our own experiences with this sort of FBI intimidation. One of us was actually picked up by FBI wiretaps involving 9/11 information. The phone tapping led to the FBI – or some similar – agency writing us emails suggesting that we cooperate with them in investigating off shore activity that some involved in The Daily Bell were supposedly involved with. The emails were signed by someone called Nalum and then more recently by someone who called himself “God.” These emails have kept up on and off for an incredible seven years now, which shows the extent of institutional memory. The group has even written an expose of supposed activities using a spurious author who supposedly has no affiliation with police work but obviously does. Even more incredibly, the FBI, or whatever it is, has decided the way to expose The Daily Bell is via an accusation of Fake News. The Daily Bell has been put on a list of groups that are supposedly involved with producing Fake News, including The Drudge Report and others. When the time comes, the Fake News accusations will be triggered and the article and other information they have gathered over seven years will be suddenly “discovered” and further publicized. The idea is to avoid exposing the initial methodology of the 9/11 wiretapping which was patently illegal and outrageous. That is our “FBI” story which has led at least one of us to abandon the US and travel abroad, for which he later received a death threat suggesting he kill himself. This is a tactic the FBI has used since encouraging Martin Luther King Jr. to kill himself in a letter they sent him. Conclusion: The article, finishes by explaining that “When and if a true history of the FBI is ever written, it will not only track the rise of the American police state but it will also chart the decline of freedom in America.” We can certainly vouch for that and for the FBI’s insatiable, illegal energy in pursuing people who are writing columns and articles it doesn’t like. Sharyl Attkisson was a star investigative reporter for CBS News. After two decades at the network, she resigned on March 10, 2014. Among the controversial stories she covered: the Fast and Furious gun-walking program, in which the government “purposely allowed licensed firearms dealers to sell weapons to illegal straw buyers, hoping to track the guns to Mexican drug cartel leaders and arrest them” (LA Times, 10/3/11); the Benghazi attacks and murders; the CDC fraud in grossly overestimating the number of Swine Flu cases in America. Attkisson now hosts a weekly television news program, Full Measure, for the Sinclair Broadcast Group. She writes at sharylattkisson.com. Attkisson is also engaged in a struggle with the federal government. For some reason, Attkisson isn’t permitted to see her FBI file. Why? The answer may lie in the government’s role as a hacker. A hacker of Attkisson’s computers. Yesterday, I asked Attkisson: in your opinion, why were your computers hacked? My comment: As indicated at the beginning of this article, Attkisson is unable to see her FBI file. The FBI won’t show it to her. This is a breach of law. They won’t show it to her because it would reveal the FBI and DOJ stance on her investigative work at CBS. They didn’t like her work. They considered it a threat. They considered it an exposure of truths they wanted kept under wraps, relating to Fast and Furious, Benghazi, Green Energy Waste, etc. That FBI file would lend further strength to Attkisson’s claim that the Dept. of Justice has been lying about what they found when they investigated the hacking of her computers. For example: They found that some of their own people (FBI/DOJ) and/or people at other government agencies had done the hacking. Major media consider this story “dead until further notice.” But independent journalists all over the world shouldn’t. They should cover it aggressively and keep the pot boiling, and make sure the public understands what is at stake: the right to report actual news, free from government interference and intimidation. And the right to call government on the carpet, in court, under oath, to account for their crimes.